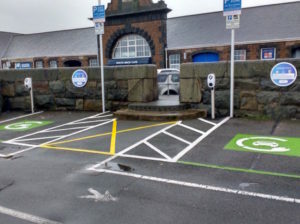 The first publically available electric vehicle charging stations on Guernsey are now available to use. The new charge stations are on a pay as you go basis. Introduced as part of the island’s Integrated Transport Strategy, the two stations are aimed at both locals and tourists and are located in three-hour parking spaces along the southern wall of the North Beach car park. The stations can be used by customers downloading the free ‘EOApp’ from the App Store and Google Play or from phoning the number displayed on the machines. Charging costs £1.50 per hour up to a three-hour maximum and any non EV drivers using the spaces are liable for a fixed penalty fine. EV drivers can also access new 10-hour ‘priority parking’ electric and hybrid vehicle parking spaces immediately west of the charging units. The council said it would monitor usage with a view to expanding the initiative to other locations. Existing charging points on the island are available at Les Douvres Hotel and Hotel De Havelet for guests and non guests, while the Renault dealership at Freelance Motors also has a charging point that may be accessed by arrangement.